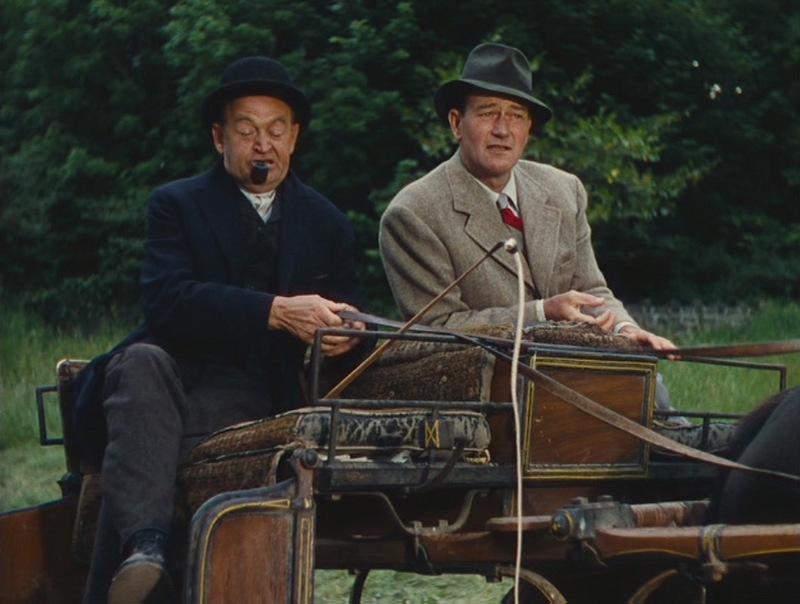 Based on a 1933 short story by Maurice Walsh, The Quiet Man stars Ford’s favorite actor John Wayne as Sean Thornton, a former boxer from Pittsburgh who is returning home to reclaim his family’s land in Ireland. The setting, Inisfree, is fictional, but much of the movie was filmed on location in western Ireland around the village of Cong, County Mayo. For the film’s rich cinematography, Ford wisely tapped Winton C. Hoch, the innovative director of photography who greatly contributed to the development of Technicolor in 1936. 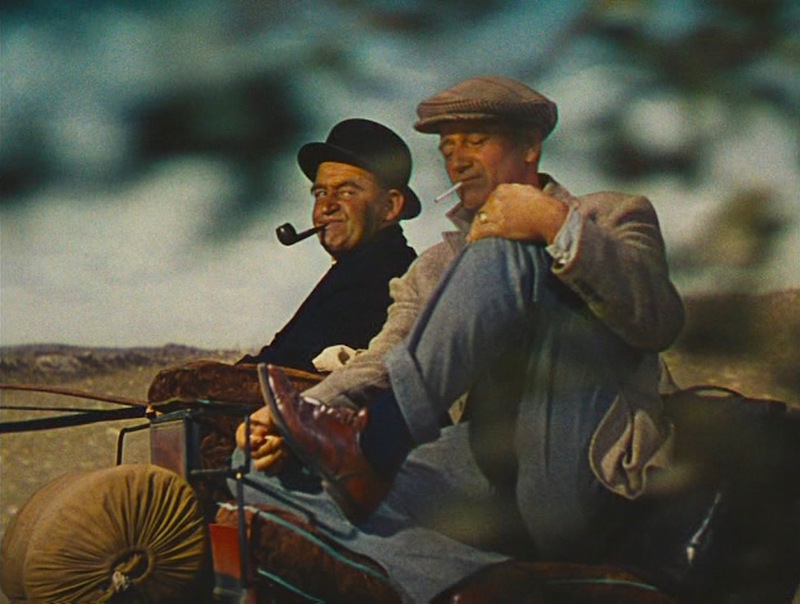 Both Ford and Hoch would win well-deserved Academy Awards for their work on The Quiet Man. 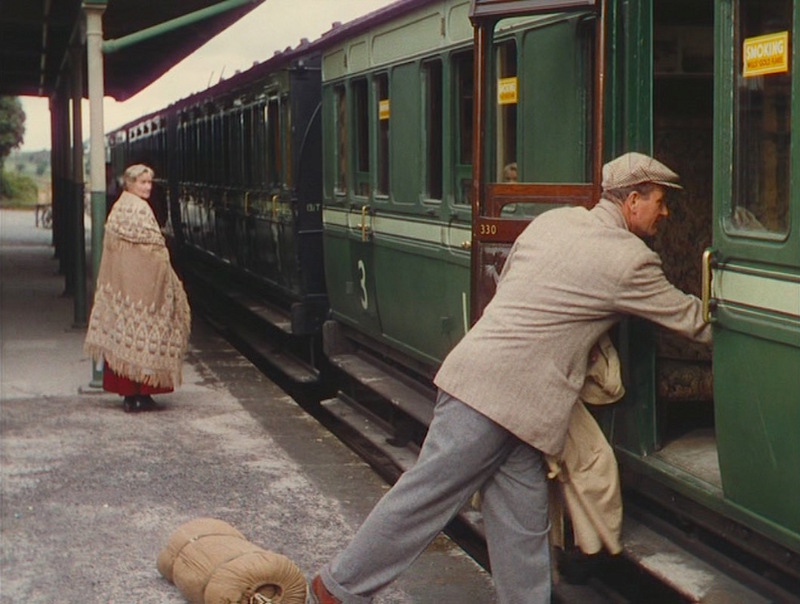 “He didn’t have the look of an American tourist at all about him,” Father Peter Lonergan (Ward Bond) remarked with approval in his narration upon Sean’s arrival by train at Castletown. Indeed, with his tweed jacket, flat cap, and flannels, Sean Thornton looks every bit the native Irishman. Tweed has a long legacy as a rugged, weather-resistant fabric associated with country pursuits in Ireland and the United Kingdom. 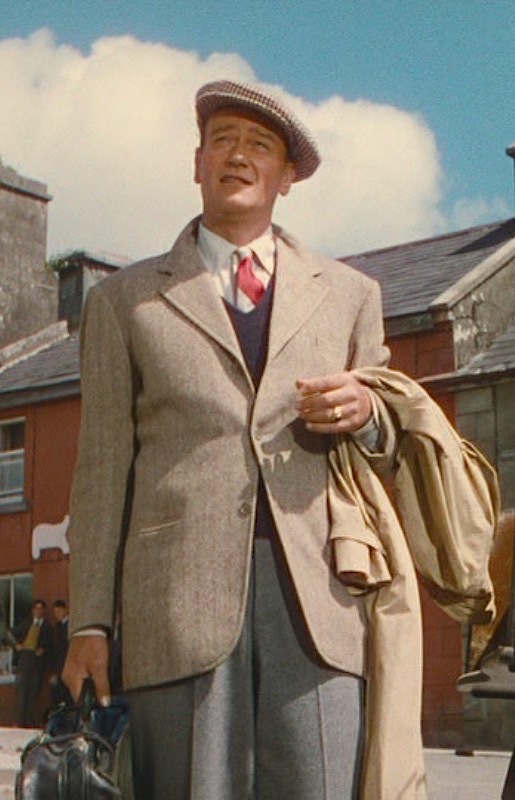 “Many of the costumes were tailored by the O’Máille family,” states the O’Máille website, which continues to mention that John Wayne and Maureen O’Hara both visited its store in Galway for their characters’ costumes, making it highly likely that John Wayne wore authentic, locally handwoven Irish tweed for his role in this most Irish of movies. Sean Thornton is warmly welcomed in his homeland. It helps that he’s wearing locally made duds. Sean’s tweed is a herringbone twill weave of beige and light brown yarns to create an overall tan effect with a slight cast toward taupe. The single-breasted jacket has notch lapels that are often worn with the back collar flipped up for a touch of insouciance. The notch lapels and the welted breast pocket have “swelled edge” seams. The jacket also has straight jetted hip pockets in line with the lowest button. 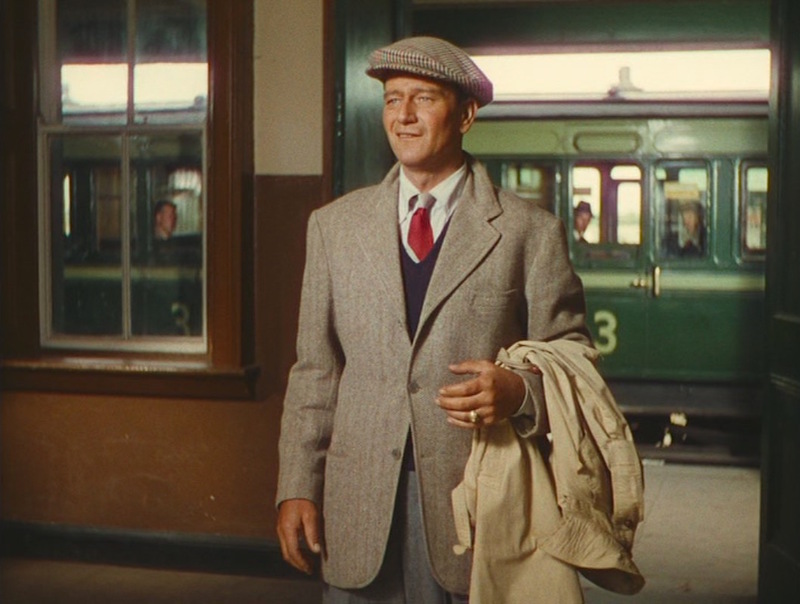 At a towering 6’4″, John Wayne benefits from the visual balance that a three-button jacket affords him, and he typically wears this jacket with the center button correctly fastened unless he’s lounging on Michaeleen’s taxi. All three buttons on the front and the sets of three smaller non-functioning buttons on the end of each sleeve are all tan plastic sew-through buttons. Another benefit of a well-tailored single-breasted jacket is that you won’t look uncomfortable when seated with a button fastened. Although Sean’s tweed jacket is pure Ireland, his button-down collar shirt, striped tie, and v-neck jumper are indicative of his Americanization. The jumper, or sweater as we Americans tend to call it, is navy wool with a v-neck deep enough to show off the tie striping and the long points of the shirt’s button-down collar. The cotton button-down shirt is patterned with hairline blue stripes on a white ground that appears solid pale blue from a distance but is clearly striped – albeit thinly – in close-up shots. Sean uniquely wears his jacket lapels on top of his raincoat collar… though I’m not sure of the utility of this outside of giving that great tweed jacket more screen time. Sean’s red and silver satin silk tie is boldly striped in the American “downhill” direction of right-down-to-left. Each stripe is quite broad, possibly around 6″ wide. 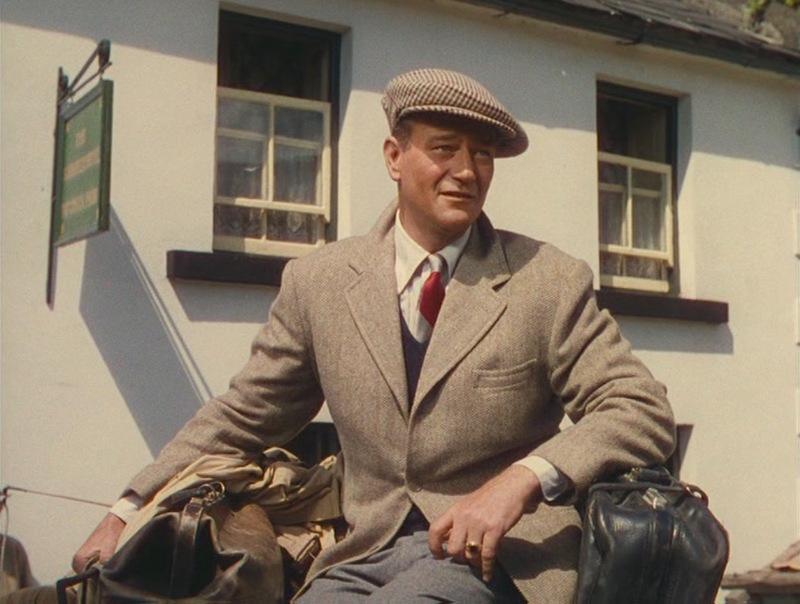 More of Sean’s tie is seen when he returns to his new cottage, sans jumper, and runs into Mary Kate Danaher (Maureen O’Hara). Sean Thornton wears a pair of gray flannel trousers that effectively balance both the tweed jacket as well as his preppy shirt, tie, and sweater. These flat front trousers have a full fit with straight side pockets, no back pockets, and turn-ups (cuffs) on the bottoms. Assuming they are the same trousers that he later wears with his navy work shirt for the film’s climactic fight, they have belt loops through which he wears a slim brown leather belt with an ornate gold single-prong buckle and tip. Sean Thornton’s brown shoes for his arrival in Ireland are the ideal footwear for a dressed-up day in the country: more harmonious in color and formality with this outfit than the black oxfords he later wears with his navy double-breasted suit and certainly more appropriate to wear with a tweed jacket and tie on the train than his work boots. These chestnut calf leather derbies are semi-brogued with a straight cap-toe. Sean wears them with his usual dark navy cotton lisle socks. From using a candle to igniting a match on the bottom of his shoe, Sean Thornton always looks cool as he’s lighting up a cigarette… though he tends to just throw it away after two puffs. 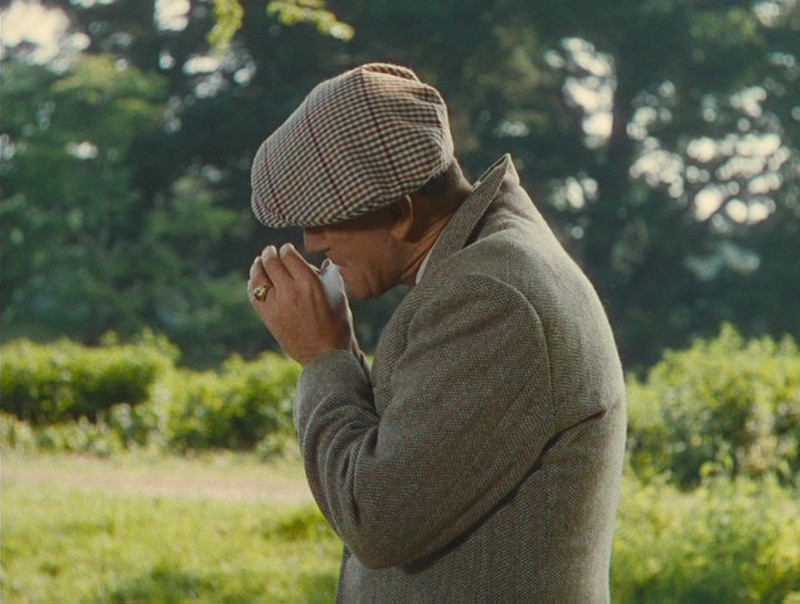 Sean’s plaid tweed flat cap is covered in an olive-on-tan gun club check with a red-and-rust overcheck. Sean lights yet another Chesterfield that will last him two puffs before he tosses it away. At least this time, he has a good excuse. For his Sunday church visit, Sean wears the same outfit as the day before but with a charcoal felt fedora with a pinched crown and slim grosgrain band. Evidently, this is Sean Thornton’s “Sunday best”. 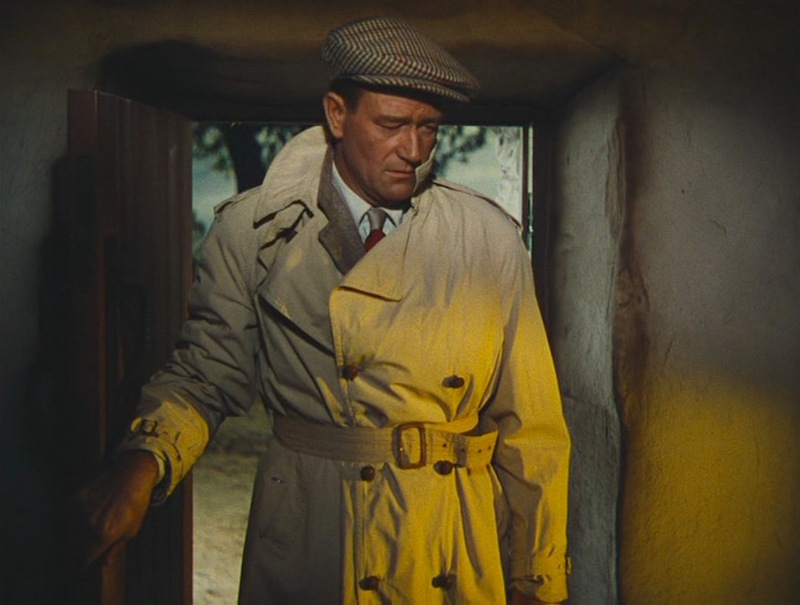 He carries it for most of the scenes following his arrival, but Sean Thornton actually dons his khaki gabardine trench coat when arriving at his family’s cottage. The trench coat as we know it had been popularized the previous decade during World War I as practical and weather-resistant combat outerwear for the British Army. Sean’s trench coat has a double-breasted front of six brown woven leather buttons, with three to button, and a matching belt fastened through a large single-prong brown buckle. The trench coat has the traditional epaulettes (shoulder straps), storm flaps, buckle-belted cuffs, and single back vent all associated with the usual trench coat. The slanted side pockets have a pointed flap that would button closed to protect the contents from the weather, but Sean wears his pockets unbuttoned. 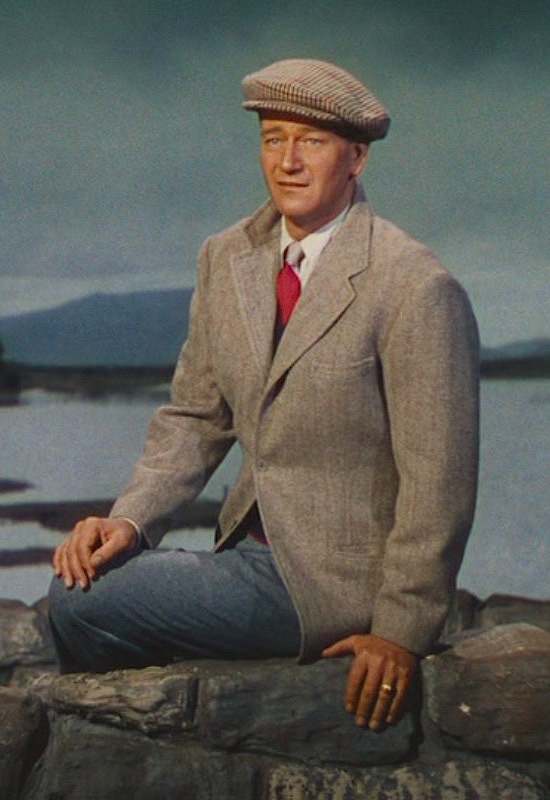 The entire outfit is more or less retired after Sean establishes himself in Inisfree, though he does wear the tweed jacket, checked cap, and gray flannel trousers with the more casual combination of a navy flannel work shirt and beige vest later in the film. “I’ll try one of those black beers,” requests Sean as he strides into the local pub. “Ah, the porter. Yes, sir,” replies the barkeep. 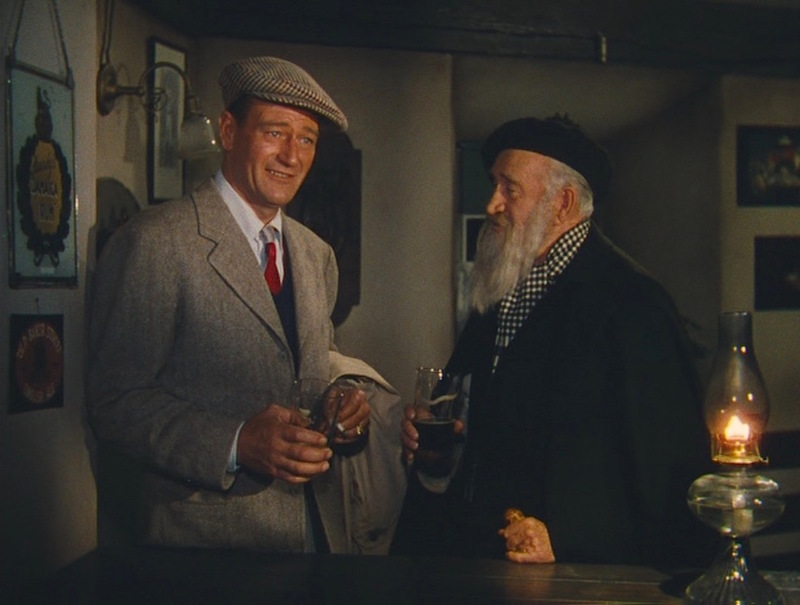 The bearded fellow joining John Wayne for a swig of porter is Francis Ford, brother of director John Ford who would appear in many of his films. Although it was developed in London, the brewing of porter-style beers enjoys a long Irish legacy that dates back to 1776. A decade later, Arthur Guinness of County Kildare began brewing his eponymous beer, and the output of the Guinness Brewery was exclusively porter by the end of the 18th century. The term “stout” developed as a way for early bartenders and beer-drinkers to describe the strength of porters, though even Guinness had dropped the name from its Extra Superior Product by 1840, branding itself with the now-recognizable name of Guinness Extra Stout. 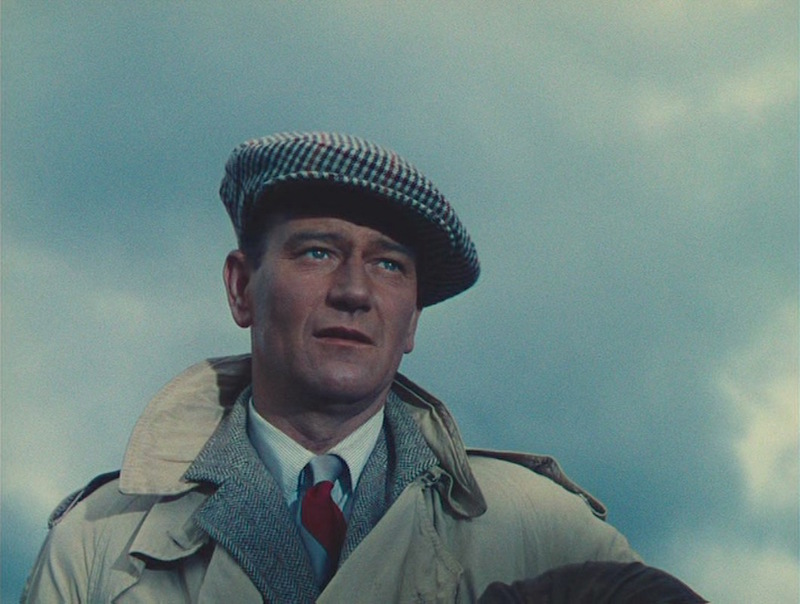 John Wayne blends traditional Irish country tweed with classic Ivy League style for a harmonious, strong, and timeless look that would work just as well nearly a century after the film was set. Check out the movie, and make sure it’s the remastered 60th anniversary edition to take full advantage of the Academy Award-winning cinematography by Winton C. Hoch. I’m Sean Thornton, and I was born in that little cottage over there, and I’ve come home, and I’m gonna stay… now does that answer all your questions once and for all, you nosy little man? You think Duke looks good in a tweed three-button jacket? Check out this look from McQ, John Sturges’ contemporary cop thriller made two decades later. 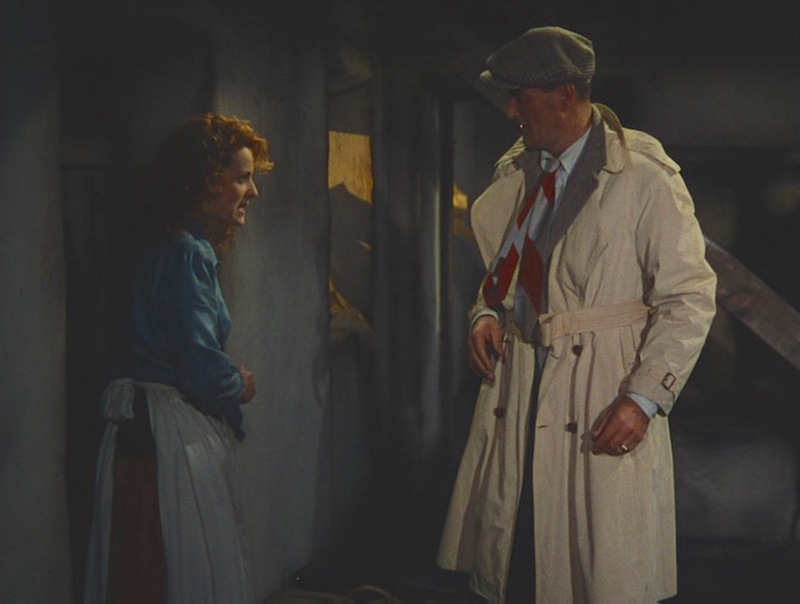 Interestingly, though it’s the national color of Ireland and we Americans often sport it for St. Patrick’s Day, green only rarely appears on the clothing of The Quiet Man‘s characters, most significantly on Maureen O’Hara’s green floral dress and never on John Wayne’s visible clothing. There is, of course, plenty of beautiful green in the natural scenery.